I had the opportunity to attend a Forced Migration Upward Mobility Project (FMUMP) workshop on October 16th in New York City where Dr. Faith Nibbs presented her report Moving into the Fastlane: Understanding Refugee Mobility in the Context of Resettlement. It is great reading and gives us much to think about to improve employment outcomes for clients. One of the main goals of FMUMP is to assist refugees (and employment practitioners), to find jobs that pay a living-wage as defined generally as $5 over the minimum, but it will vary based on the market. Her team did research in the Dallas and Ft. Worth communities over a period of 2.5 years. They interviewed refugees, employment staff, and scholars – 350 in total. And they observed 300 hours of service provision and reviewed all available data and literature on the topic. With targeted skills training it took just over one year to break the living wage threshold. The study found this to be the single greatest impact on wages. This was true for all the sub-populations – including highly skilled, low skilled, for men, and for women. Dr Nibbs went through a Return on Investment calculation that showed the net effect when making these wage gains – the savings on government assistance (Food Stamps etc. ), plus the increased taxes paid by the refugee at the new wage, and that weighed against the cost of job skills training of approximately $3,000 per person. The ROI to the government is about 600%. So the investment by the government in skills training makes good sense. This teaches us a couple of things. Employment teams should be looking for job skills training for clients from all possible sources – government, community college, and company-led – now knowing this is the single biggest influencer. The study found it to be more important than the general English language training that is available. They discovered that the typical ESL that occurs for a few hours per week and teaches general conversation has less of an impact. See the report for interesting ways to improve this instruction such as an on-line platform for more cumulative hours, and the very positive effect of tailoring the vocabulary instruction to the work place. Dr. Nibbs had thoughts about other issues undermining living wage attainment. It was discovered that refugee clients are not given an understanding that while yes they need to take the first job, there are certain industries that are much more financially rewarding and will pay a living wage. This research has shown that clients by and large had no idea that they would never make ends meet nor advance up the pay scale in certain sectors. It was thought that Case Managers themselves might not be aware of this hierarchy of earning potential by industry sector. There are a few interesting pilots occurring to address these gaps. The Office of Refugee Resettlement has funded a Career Navigator position in the State of Washington to determine if this can create a bridge for better placements and better information conveyed to refugees. IRC has five Career Development sites that provide to refugees targeted career training one year after arrival for those unemployed. There should be some interesting learnings down the road. The report is here – http://www.fmump.org/ – on the home page there is an option to download. 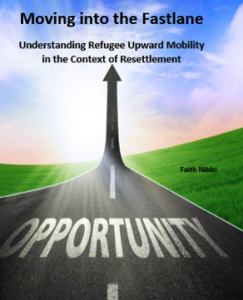 You may also be interested in checking out Dr. Nibbs’ presentation at Higher’s Second Annual Refugee Employment Conference, which took place in Omaha, NE in November, 2015: http://higheradvantage.org/second-annual-refugee-employment-workshop-resources/ .